Down from 28% in 2009 to 20.3% in 2015, marking its seventh consecutive quarterly fall. Now, connect the dots... At above 90, we will have 'significant repercussions' and oil is already at around 37. 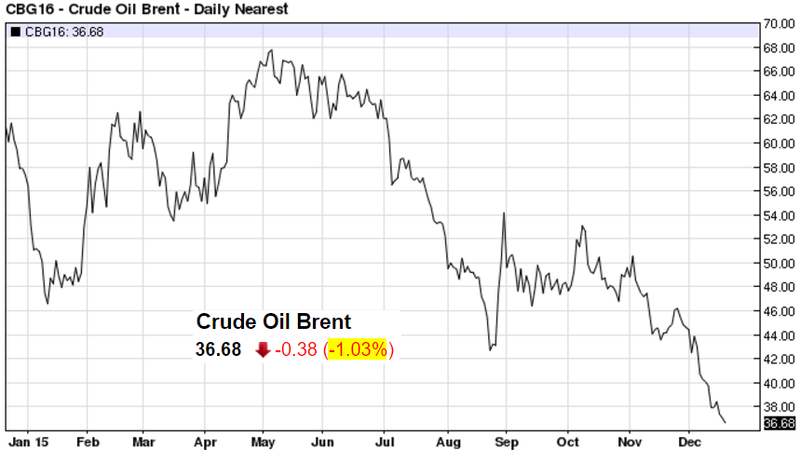 What is more, all of the above references Brent prices. 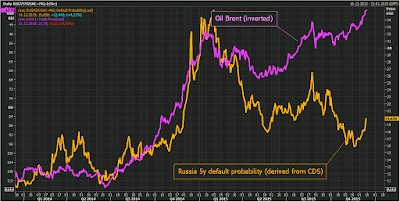 But Urals-Brent spread has been pretty awfully 'unfair' to Russian energy suppliers, and with the glut of eager and ready substitutes producers in the markets, the spread is unlikely to improve. Which means that 'above 90' can be 91 or it can be 95 or it can be 88... go figure. 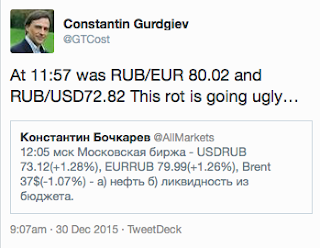 Then again, may be, by some miracle, the New Year will be a happy one for the Ruble. While IMF (belatedly) is warning about the risks of slower global growth, the Baltic Dry Index - a strong instrumental variable for global trade flows - has been sinking and sinking, like a brick searching for the bottom. Yes, IMF did project back in October WEO that global growth will reach 3.56% in 2016, up on 3.123% in 2015. And that the growth in volume of trade flows will rise form just under 3% to 4.3%, with much of this growth accounted for by increased rate of growth in trade in goods (from 2.9% in 2015 to 4.13% in 2016). But, hey... one day someone will be booking real stuff on foot of IMF forecasts. 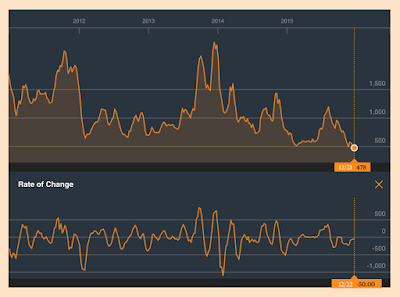 Until then, good news-bad news from Washington forecasters mean zilch for the Baltic Dry. 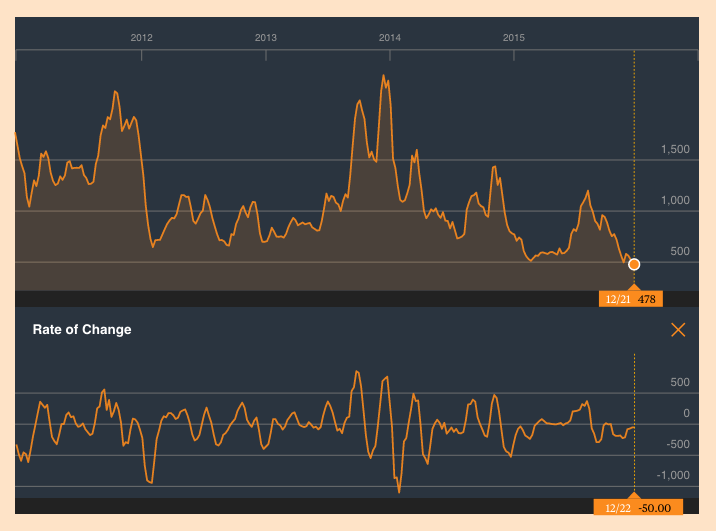 30/12/15: US Junk Bonds: Heading into a New Defaults Wave?.. U.S. 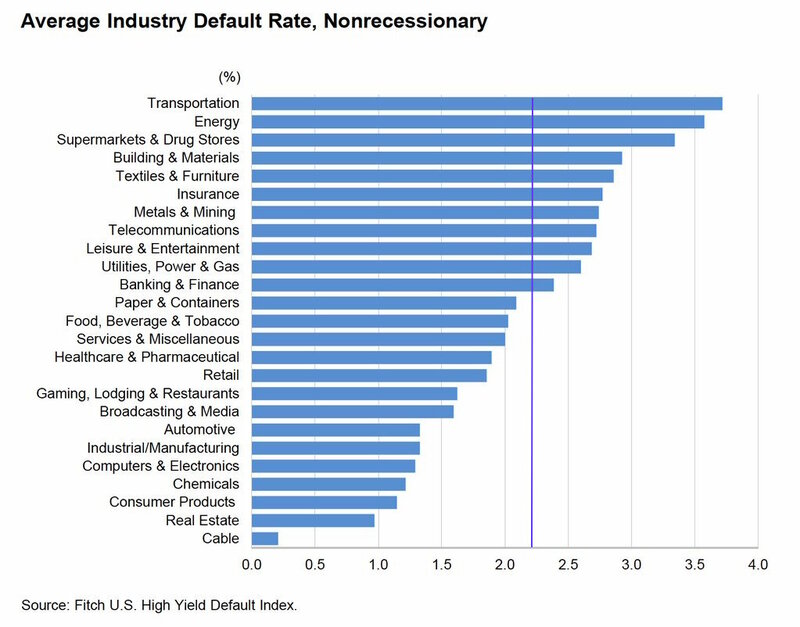 Junk Bonds markets have been a canary in the proverbial mine of the global economy since 2014, when we first felt some tremors in the markets. 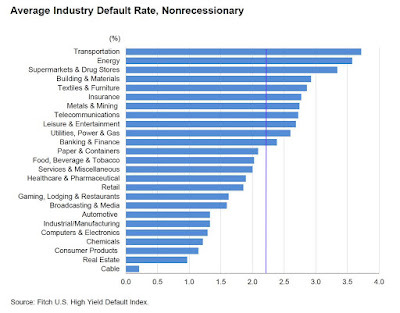 But so far, default rates for the junk bonds remained relatively subdued, albeit rising. The average in the historical series ex-recessions is close to 2.2%, which would make 2016 forecast for 4.5%... err... touchy, to say the least. It is also worth noting that in three pre-Global Financial Crisis recessions, build up in default rates was gradual, over two-four years. We are now two years into such a build up. 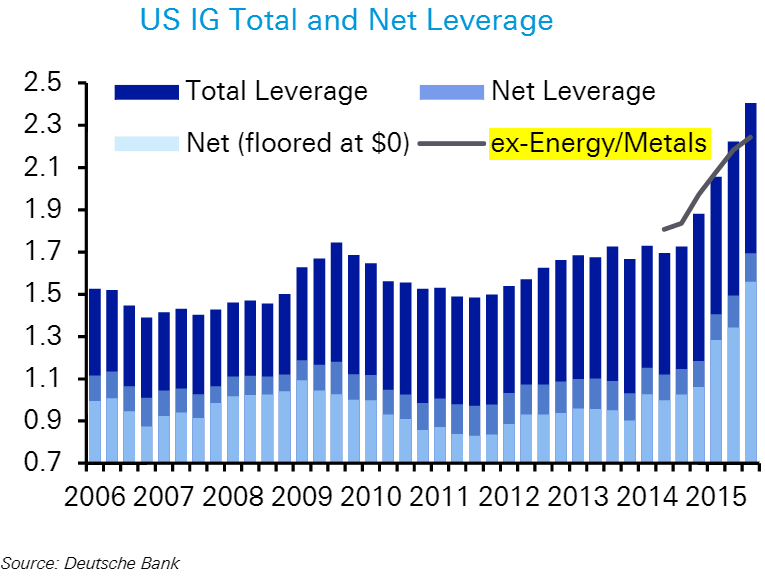 In a post yesterday, I mentioned USD3 trillion hole in global bonds markets looming on the horizon as the U.S. Fed embarks on its cautious tightening cycle. Now, couple more victims of that fabled 'normalization' that few in the markets expected. 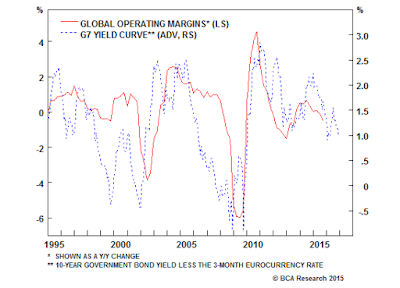 "Over the past two decades, the G7 yield curve has been an excellent leading indicator of global margins. Currently, not only are short-term borrowing costs becoming prohibitive, at the margin, but the incentive to raise debt and retire equity to boost EPS is diminishing. 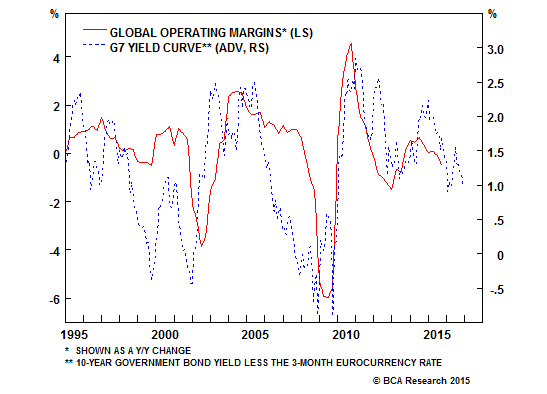 This suggests that profit margins have likely peaked for the cycle." Now, absence of margins = absence of capex. And absence of margins = profits growth on scale alone. Both of which mean things are a not likely to be getting easier for global growth. Now, take BCA conclusion: "Finally, global junk bonds are pointing to a drop in equities in the coming months, if the historical correlation holds. 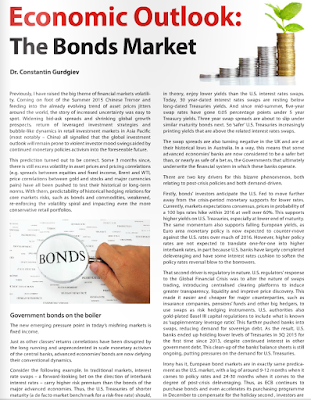 Indeed, we are heeding the bond market’s message, and are concerned about margin trouble and the potential for an EM non-financial corporate sector accident: remain defensively positioned." In other words, given the leverage take on since the crisis, and given the prospects for organic growth, as well as the simple fact that advanced economies' corporates have been reliant for a good part of decade and a half on emerging markets to find growth opportunities, all this rates 'normalizing' ain't hitting the EMs alone but is bound to under the skin of the U.S. and European corporates too. My new column for Slon.ru is now live and available here: Эпоха несправедливости. Почему России нужно разделять политику и бизнес. With the pause in ECB QE over the holidays season, bond markets have been largely looking forward to 2016 and counting the blessings of the year past. The blessings are pretty impressive: ECB’s purchases of government bonds have driven prices up and yields down so much so that at the end of this month, yields on some USD1.68 trillion worth of Government bonds across 10 euro area countries have been pushed below zero. Value of bonds with yields below ECB’s -0.3% deposit rate, which makes them ineligible for purchases by the ECB, is $616 billion, just shy of 10 percent of the $6.35 trillion of bonds covered by the Bloomberg Eurozone Sovereign Bond Index. 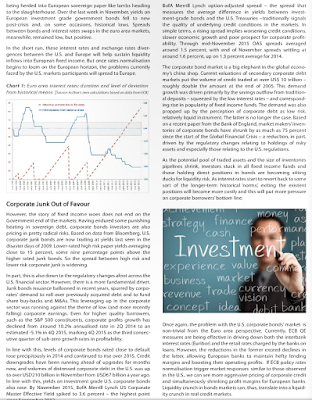 As the share of the total pool of marketable European bonds, negative yield bonds amounted to more than 40% of the total across Europe at the start of December (see here: http://www.marketwatch.com/story/40-of-european-government-bonds-sport-negative-yields-and-more-may-follow-2015-12-02). 2) Will low inflation environment remain supportive of monetary easing? Market consensus is that it will and that inflation is unlikely to rise much above 1% in 2016. In my view, both consensus positions are highly risky. 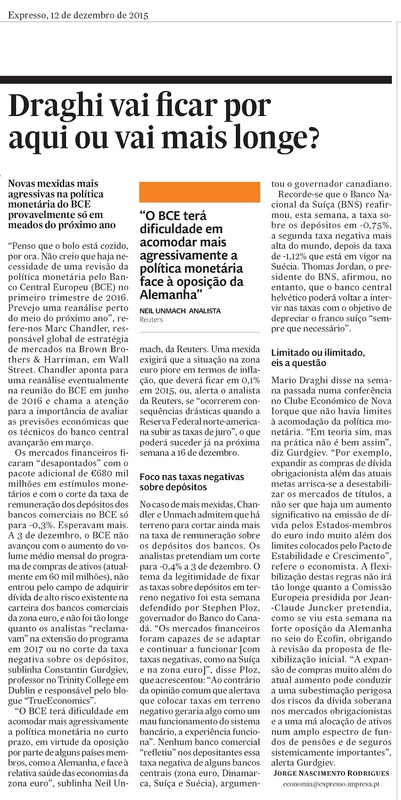 On ECB expectations. Setting aside inflationary dynamics, ECB has continuously failed to ‘surprise’ the markets on the dovish side. 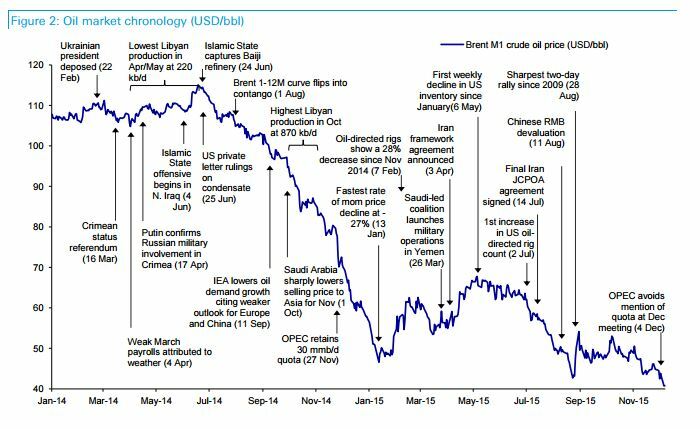 Nonetheless, the markets continued to price in such a surprise throughout 2015. 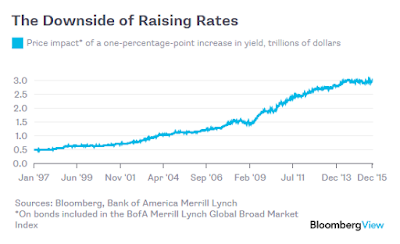 In other words, current pricing is probably already reflecting high probability of the QE extension/amplification. 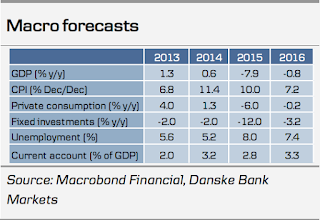 There is not much room between priced-in expectations and what ECB might/can do forward. Beyond that, my sense is that ECB is growing weary of the QE. The hope - at the end of 2014 - was that QE will give sovereigns a chance to reform their finances and that the economies will boom on foot of cheaper funding costs. 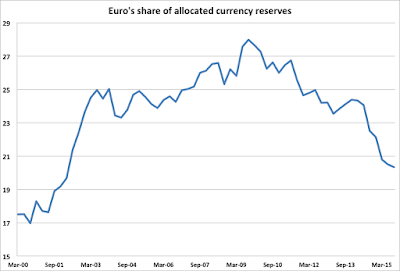 Neither has happened and, if anything, public finances are remaining weak across the Euro area. The ECB has been getting a signal: QE ≠ support for reforms. And this is bound to weigh heavily on Frankfurt. On inflationary side, when we strip out energy prices, inflation was running at around 1.0% in November and 1.2% in October. On Services side, inflation is at 1.2% and on Food, alcohol & tobacco it is at 1.5%. This is hardly consistent with expectations for further aggressive QE deployment and were ECB to engage in more stimulus, any reversion of energy prices toward the mean will trigger much sharper tightening cycle on monetary side. European bonds are more sensitive to the ECB rate hikes than the global bonds are to the Fed hike, primarily because they are already trading at much lower yields. Per latest report from the Economy Ministry, Russian GDP contracted 0.3% m/m in November in real terms and is down 3.7% y/y over 11 months through November 2015. Compared to 12 months ago, November GDP was down 4%. 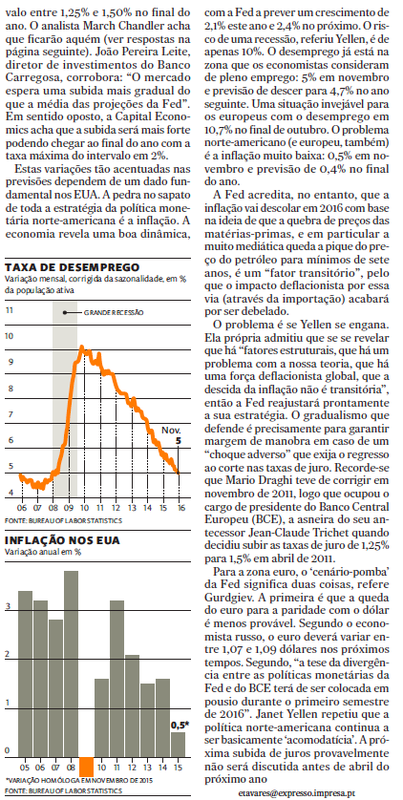 This implies that, the economy will likely be down 3.8 percent (by my estimates: 3.8-3.9 percent) in 2015 as a whole. More significantly, with November GDP being down on foot of weaker oil prices and with crude prices continuing to contract through December, we are now less likely to see stabilisation in the economy (zero growth or return to positive growth) in 1Q 2016. Meanwhile, in November, real wages were down 10% y/y while retail sales were down 13% for eleventh month in a row, according to Rosstat. Rosstat data shows that over the last 12 months through November, food sales were down more than 11% and non-food goods sales fell nearly 15%. 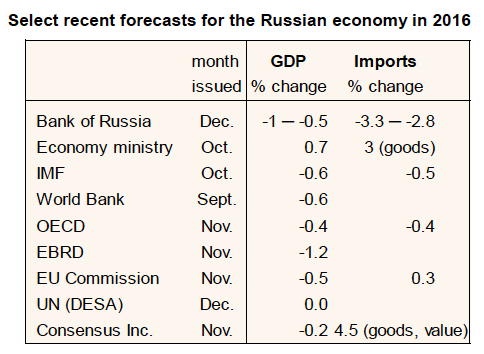 The figures for November 2015 show sharper contraction, in part because in November 2014 retail sales in Russia actually rose on foot of rapid devaluation of the Ruble. But overall, private consumption in Russia continues to run at a level consistent with where it was back in 2011. As noted recently by BOFIT, private consumption in Russia is still some 10 percent above where it was pre-crisis in 2008. 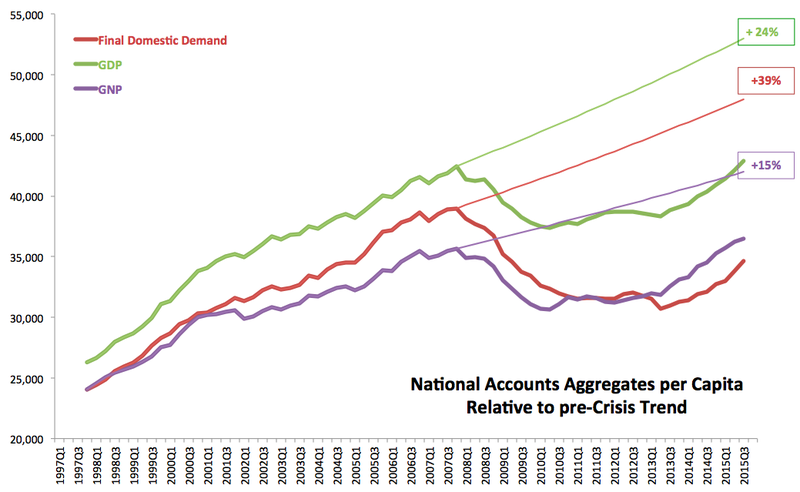 Which is no mean feat, as for example, in the case of Ireland private consumption currently remains below its pre crisis levels despite the fact that Irish economy has been recovering very robustly from the crisis in recent years. 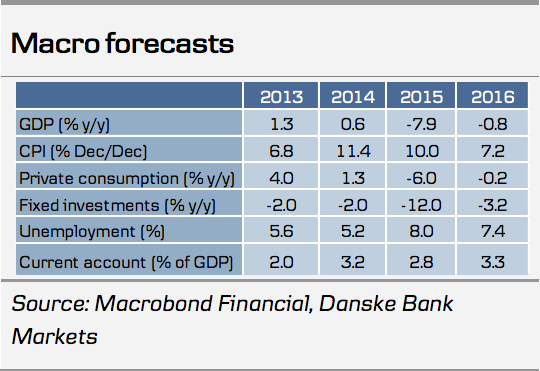 The outrun so far has been quite disappointing for the forecasting hawks, including for example Danske Bank analysts who at the end of May 2015 predicted Russian economy will shrink 7.9% y/y in 2015 ( forecast they revised to -6.2% at the end of August 2015). Or for that matter for seasoned hawks, like Andres Aslund who in January prediction put the matters thus: “Russia’s GDP is likely to plunge in 2015. 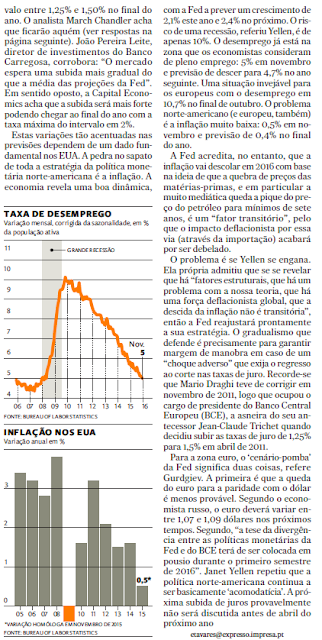 Indeed, it would be prudent to expect a slump on the order of 10 percent. In many ways, Russia’s financial situation is eerily similar to the fall of 2008, when then-Prime Minister Vladimir Putin called his country a safe haven in the global financial crisis. In 2009, Russia’s GDP dropped by 7.8 percent. In other ways, the situation seems even worse.” (H/T to @27khv for the link: http://www.the-american-interest.com/2015/01/15/russias-output-will-slump-sharply-in-2015/). But the outrun is also a bit on a reality check to some Russian political and Government figures (including President Putin and Prime Minister Medvedev) who bought into the fragile and dynamically uncertain improvements over Summer 2015 to announce the bottoming out of the economic crisis. Truth is, Russian economy is a very hard nut to crack for any forecaster, as it is currently subject to a series of coincident shocks that themselves are hard to price and predict: oil prices and gas prices slump, contracting demand for energy globally, including on foot of both geopolitical changes and warm weather; broader commodities prices collapse, including on foot of global demand weaknesses and regional (e.g. China) weaknesses; geopolitical risks and sanctions (including financial sanctions); ongoing deleveraging of the Russian banking sector (including outside Russia, especially in Ukraine and the rest of the Former USSR and in parts of Central and Eastern Europe); domestic structural weaknesses (including those that started manifesting themselves in late 2011 and continue to play weak economic hand to-date); and so on. Thus, we shall be kind to forecasters and politicians making bets on Russian economy’s direction. 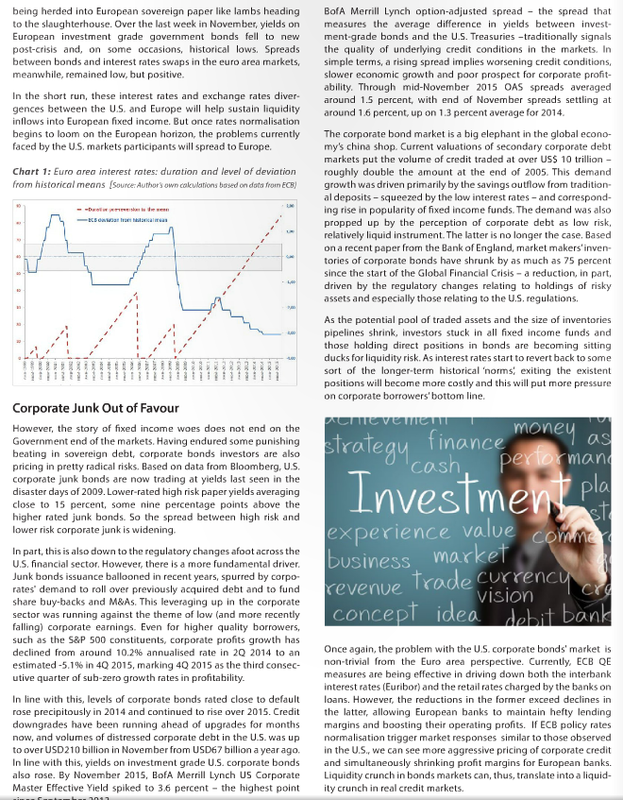 I wrote about most of the above already, including the banking sector woes (http://trueeconomics.blogspot.ie/2015/12/231215-vnesheconombank-where-things.html). And the trends in both manufacturing and services sectors were pretty clear in the PMIs (see http://trueeconomics.blogspot.ie/2015/12/41215-bric-composite-pmis-november.html). But translating these indicators into actual growth performance is a perilous task... as the November figures showed. 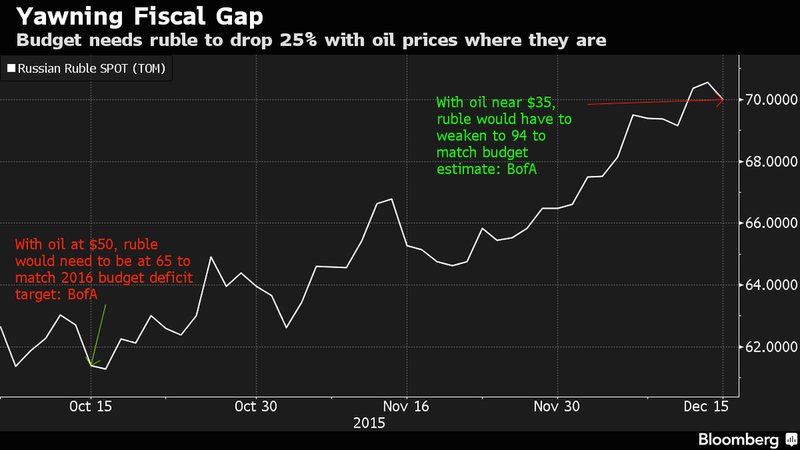 “Forecasters see the Russian economy contracting slightly in 2016. Recent economic forecasts, with the exception of the brighter projection of Russia’s economy ministry, see GDP contracting about a half per cent. A couple of forecasts expect a drop of about 1 %. 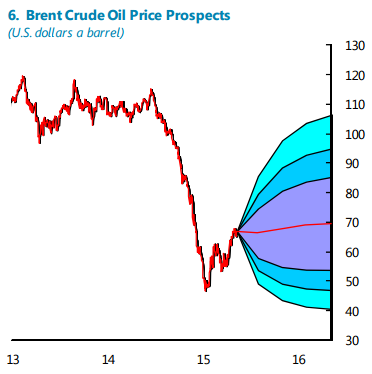 The average price of oil next year is assumed to average $50–55 a barrel. Most forecasts also see imports declining a bit further. Almost all forecasts see private consumption shrinking next year, most by about 1 %. The CBR’s forecast update this month, however, reduced its earlier projection and now expects private consumption to contract by nearly 4 %. The consumption projections reflect the anticipation that household income growth will not keep up with inflation, especially as increases of public sector wages and pensions have been set very low due to the frail condition of government budgets. My view on Russian economic growth prospects for 2016 were reflected in my column for Slon.ru: http://trueeconomics.blogspot.ie/2015/12/151215-russian-outlook-for-2016-slon.html. 26/12/15: Depositors Insurance or Depositors Rip-off? In simple terms, nothing. 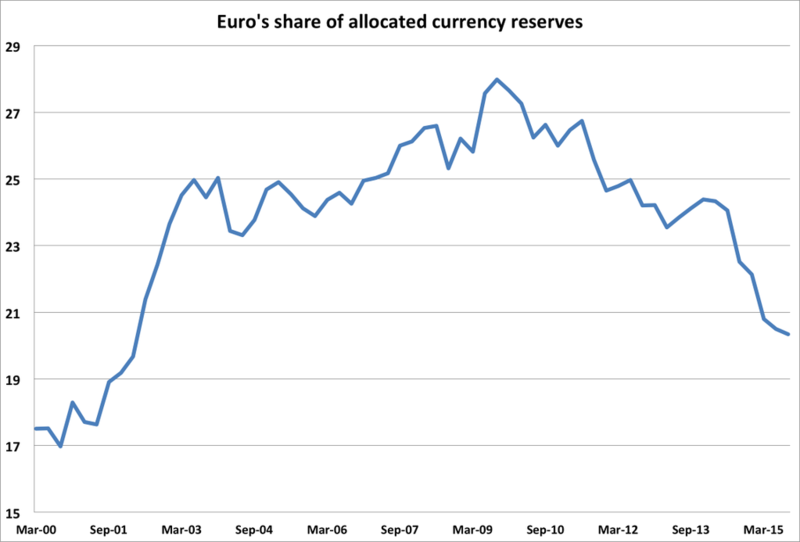 The Central Bank has embarked on building up reserves to fund any future pay-outs on deposits guarantee. In real terms, a lot. Central Bank deposits guarantee will be funded from bank levies. However, in current market environment of low competition between the banks in the Irish market, these payments will be passed onto depositors and customers. Hence, depositors and customers will be funding the insurance fund. 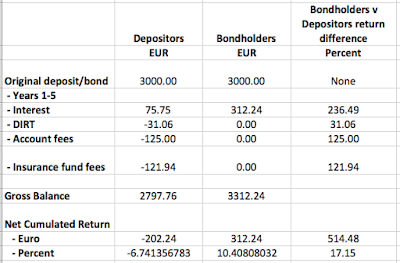 Which sounds just fine, except when one considers a pesky little problem: under the laws, and contrary to all the claims as per reforms of the EU banking systems, depositors remain treated pari passu (on equal footing) with bondholders (see note here on EU's problems with doing away with pari passu clause even in a very limited setting: http://trueeconomics.blogspot.ie/2015/11/271115-more-tiers-lower-risks-but.html). Now, let's consider the following case: bank A goes into liquidation. Depositors are paid 100 cents on the euro using the new scheme and bondholders are paid 100 cents on the euro using the old pari passu clause. Consider two balancesheets: one for depositor holding EUR100 in a deposit account in an average Irish bank over 5 years, and one for the bondholder lending the same average bank EUR100 for 5 years. 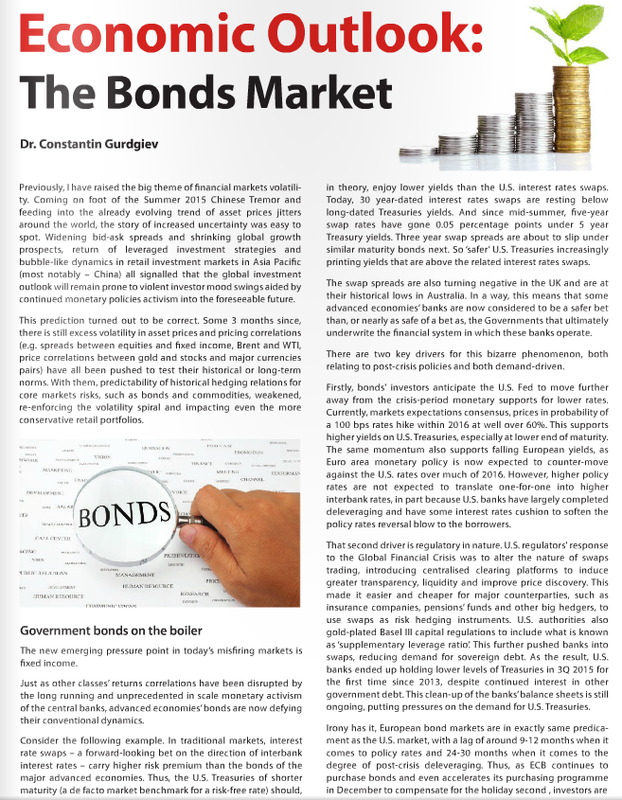 Bondholder is liable for none of the above costs, whilst collecting higher returns on their bonds. 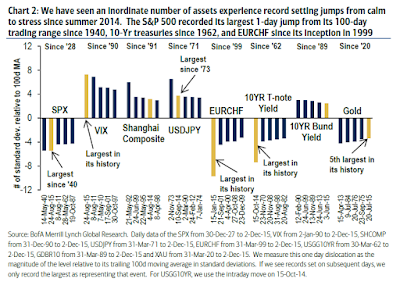 So, same risk, different (vastly different) returns. Still think that insurance fund we are about to pay for a fair deal?.. Anyone watching financial markets and economics in 2015 would know that this year was marked by a huge rise in volatility. Not the continuous volatility along the established trend, but a 'surprise' volatility concentrated on the tails of distributions of returns and growth numbers. 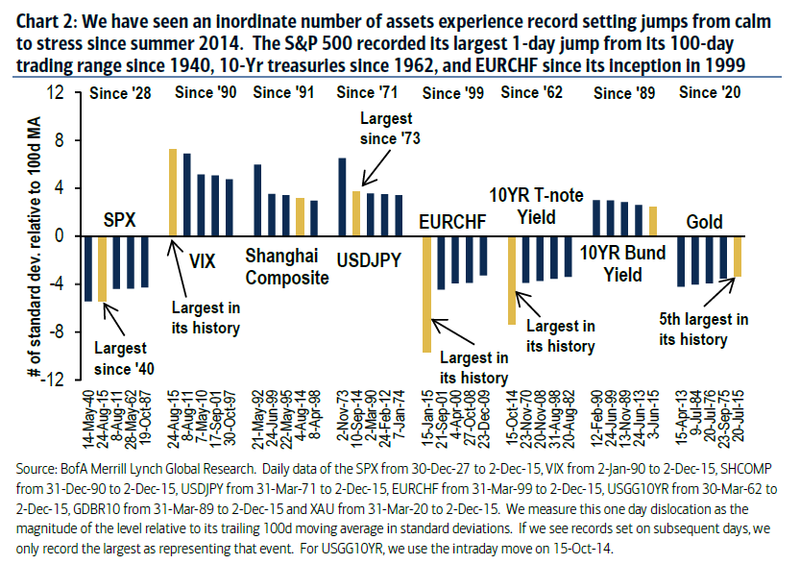 In other words, the worst kind of volatility - the loss and regret aversion type. Here are two charts confirming the said pattern. 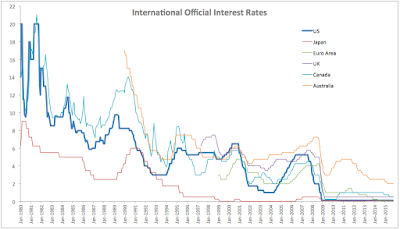 In the 'repaired' world of predictable monetary policy with well-signalled forward guidance, 2015 should have been much calmer, as policy surprises were nowhere to be seen (Bank of Japan continued unabated flooding of money, while ECB embarked on its well-in-advance-flagged QE and the Fed 'cautious rates normalisation' switched was anticipated for months, amidst BOE staying put, as predicted by everyone every time London committee met). Alas, that was not the case and 2015 ended up being a year of more extreme shifts into stress than any other year on record. 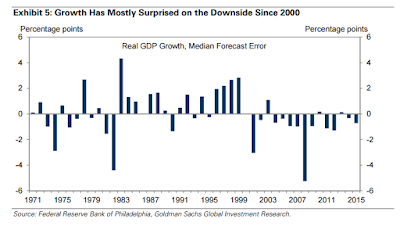 Per above, 2015 has been a second consecutive year with U.S. GDP growth surprising forecasters to the downside. 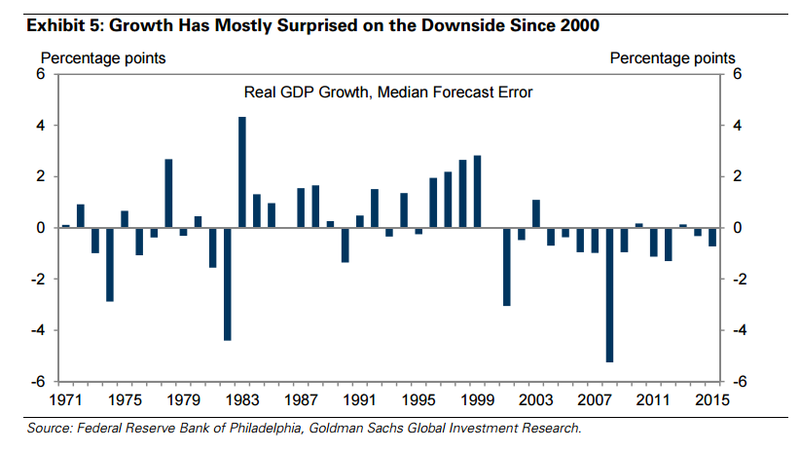 Worse, yet, since 2001, U.S. GDP growth produced downside surprises compared to consensus forecasts in 12 out of 15 years. In the past cycles, the early 1990s recession produced an exit from the downside cycle that resulted in 2 consecutive years of upside surprises in growth; for the exit from the 1980s recession, there were five consecutive periods of upside growth relative to the forecasts. Even in the horrific 1970s, the average forecast over-optimism relative to outrun was closer to zero, against the current post-recessionary period average surprise to the forecast being around -0.5 percentage points. 23/12/15: Corporate Leverage: "I miss you since the place got wrecked"
Remember all the deleveraging the U.S. economy has gone through during the crisis? Why, sure, we've learned a lesson about too much debt, did we not? and the Johnny Walker wisdom running high..."
As reported by BOFIT, Russia’s 4th largest and state-owned Vnesheconombank (VEB Group which technically is not a bank, but a development bank and an owner of a number of banks, so as such VEB is not subject to CBR supervision) requires estimated funding supports at EUR15–20 billion “to cover at least the next few years”. 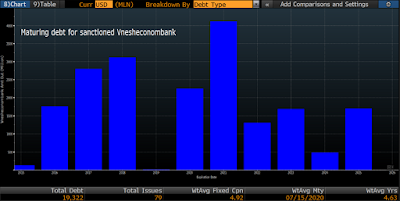 Per Bloomberg, VEB has been seeking USD23 billion “to support long-term growth and pay off the upcoming loan” (data as of November 23). VEB total assets in Russia amount to ca EUR45 billion, which, per BOFIT, “would make VEB Russia’s fourth largest bank with holdings that correspond to about 4 % of the banking sector’s total assets”. Overall, VEB holds 2.8 trillion Rubles in loans assets and around 1 trillion Rubles in other assets. To-date, VEB received EUR8 billion in deposits from the National Welfare Fund and about EUR500 million in other monies (most of which came from the Central Bank’s 2014 profits). Per both, Bloomberg and BOFIT: VEB has been a major lender behind Sochi Winter Olympics 2014. New lending increased total loans held by the bank by some 25% in Ruble terms in 2013 before doubling loans in 2014. 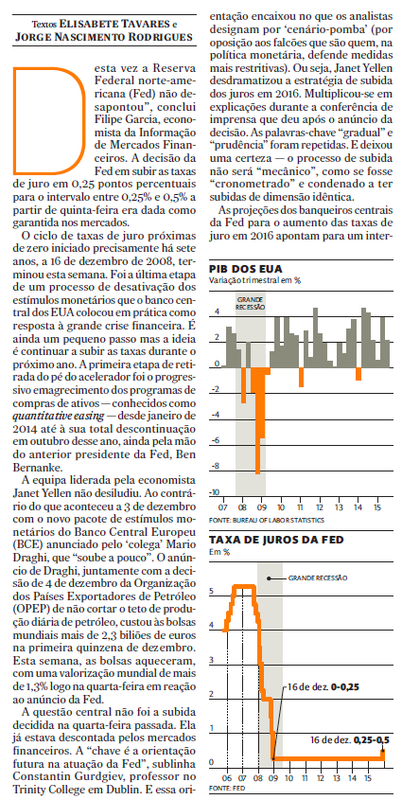 VEB started aggressive loans expansion in 2007 since when its assets base grew almost 10-fold. Over 2015, bank-held loans posted some serious deterioration in quality forcing bank to set aside significant reserves to cover potential losses. Per Reuters report, “S&P estimates some 500 billion roubles of VEB's loans were directed by the government and are therefore regarded as relatively risky. While the huge investments made in Sochi have generated public discussion in Russia, far less attention has been given to no less massive investments VEB made in Ukraine. "That's still on their books and they keep rolling those loans over. Of course it's only a question of time before they accept losses on those assets," said S&P's Vartapetov. In an interview in December 2013, VEB Chairman Vladimir Dmitriev said the bank had via Russian investors ploughed $8 billion into Ukrainian steel plants, mainly in the Donbass region, since ravaged in a separatist conflict. He said the investment had supported 40,000 Ukrainian workers, but did not say how the Russian economy had benefited.” Overall, Russian banks’ continued presence and even growth in Ukraine - while puzzling to some external observers - can be explained by the significant role these banks play in the Ukrainian economy. 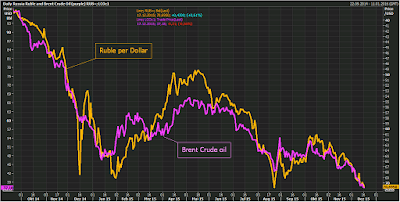 In 2014, VEB posted full year loss of USD4.5 billion / RUB250 billion and in 1H 2015 losses totalled USD1.5 billion. VEB’s Ukrainian subsidiary was one of the big drivers for these. Based on the figures, VEB posted the largest loss of any Russian company in 2014. The top three largest loss making companies in 2014 were: Vnesheconombank, followed by the steelmaking giant Mechel (loss of 167 billion rubles) and the monopoly Russian Railways (losses of 99 billion rubles). VEB is subject to both EU and US sanctions which effectively shut VEB access to funding markets and the bank will require between EUR2.5 and 3 billion for debt servicing in 2016 alone. This week, VEB secured a five-year loan of 10 billion yuan or EUR1.4 billion from China Development Bank. Recently, Finance Minister Anton Siluanov stated that VEB requires as much as USD20 billion in funding (ca 1.7% of Russian GDP), and that VEB is expected to sell some of its assets to fund part of the gap. 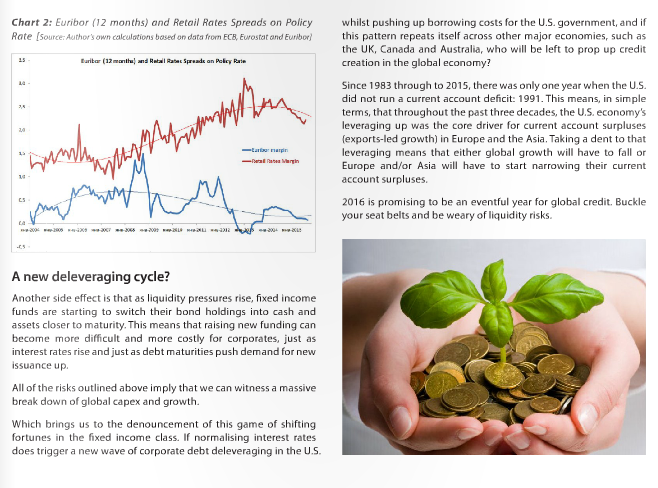 In my recent column for Slon.ru (see: http://trueeconomics.blogspot.ie/2015/12/151215-russian-outlook-for-2016-slon.html) I quipped that in the case of the Russian economy, forecasts for 2016 growth rates might just as well be taken from the fortune tellers, as there are too many moving factors driving the economy, all of which are virtually impossible to forecast. 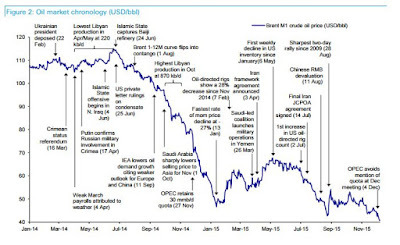 Now, h/t to @JoMichell, we have a picture of 'predictability' of one key driver of the Russian economy - oil prices. 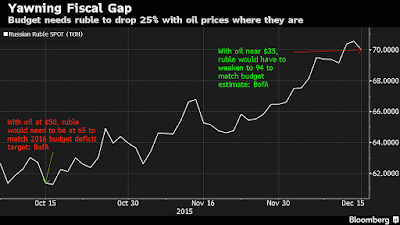 Please, keep in mind: these are Brent prices (Urals grade predictability is even lower, as Urals-Brent spread is subject to further uncertainty, including geopolitical risks and substitution risks, as discussed in my Slon.ru column). Much of the current fascination with behavioural economics is well deserved - the field is a tremendously important merger of psychology and economics, bringing economic research and analysis down to the granular level of human behaviour. However, much of it is also a fad - behavioural economics provide a convenient avenue for advertising companies, digital marketing agencies, digital platforms providers and aggregators, as well as congestion-pricing and Gig-Economy firms to milk strategies for revenue raising that are anchored in common sense. In other words, much of behavioural economics use in real business (and in Government) is about convenient plucking out of strategy-confirming results. It is marketing, not analysis. A lot of this plucking relies on empirically-derived insights from behavioural economics, which, in turn, often rely on experimental evidence. Now, experimental evidence in economics is very often dodgy by design: you can’t compel people to act, so you have to incentivise them; you can quite select a representative group, so you assemble a ‘proximate’ group, and so on. Imagine you want to study intervention effects on a group of C-level executives. Good luck getting actual executives to participate in your study and good luck getting selection biases sorted out in analysing the results. Still, experimental economics continues to gain prominence, as a backing for behavioural economics. A still, companies and governments spend millions on funding such research. The attempt is pretty darn good. The study uses robust methodology to test a statistically valid hypothesis: has there been a statically significant result derived in the studies arising from experimental treatment or not? The paper tests a large sample of studies published (having gone through peer and editorial reviews) in perhaps the most reputable economics journals. This is creme-de-la-creme of economics studies. In other words, in majority of studies claiming to have achieved statistically significant results from experimental evidence, such results were not really statistically significantly attributable to experiments. But this is hogwash. The results of the study effectively tell us that large (huge) proportion of papers on experimental economics published in the most reputable journals have claimed significant results attributable to experiments where no such significance really was present. Worse, the methods that delivered these false significance results “are standard in the profession”. Now, consider the even more obvious: these are academic papers, written by highly skilled (in econometrics, data collection and experiment design) authors. Imagine what drivel passes for experimental analysis coming out of marketing and surveying companies? Imagine what passes for policy analysis coming out of public sector outfits? Without peer reviews and without cross-checks like those performed by Young? Which means that Ukraine and Russia - so far - have failed to agree terms of debt restructuring. As a reminder, over the last few days, Ukraine and Russia were involved in a 'last minute' dialogue (via Germany) to resolve the issue. 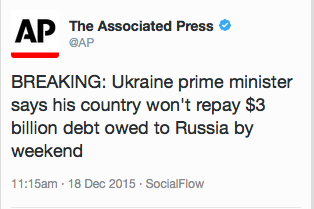 Does this mean that Ukraine is now in a sovereign debt default? Technically - no. Ukraine will only be in a default after 10 days grace period expires, which means the parties to the talks still have 12 days to reach an agreement and avoid default. Does this mean that Ukraine is now in breach of IMF lending criteria? Technically - no. IMF amended its own rules allowing lending to continue for countries in official sector default, as long as these countries continue to engage in debt restructuring negotiations with the lenders. Can the two countries reach a deal in time to avoid official default? Unlikely: any deal between Russia and Ukraine (except for a deal that treats Russia under the same terms extended to private lenders - a deal that is simply unacceptable to Russia) will require approval of other (commercial) lenders under the agreement between commercial lenders and Ukraine struck earlier. There is simply not enough time to achieve such an approval, even assuming, there is a deal and the deal can be approved (both assumptions are quite a stretch). Do both parties show will to negotiate in good faith? So far - no. Russian offer (see here) has been to restructure debt by extending repayment period (a real haircut absent nominal haircut, as far as I read this). The offer shifted Russian position in negotiations in the direction of Ukraine's position: from the opening position that the debt is official sector debt and thus should be repaid in full and in time. Ukraine's position has been to treat Russian debt equivalent to private sector debt and Ukraine (as far as public record goes) did not alter its position to move closer to Russian offer. Ukraine also deployed consistent rhetoric of "Our way or the highway" variety. In other words (I am willing to be corrected on this), Russia made insufficient step toward Ukraine, while Ukraine made no step toward Russian position whatsoever. 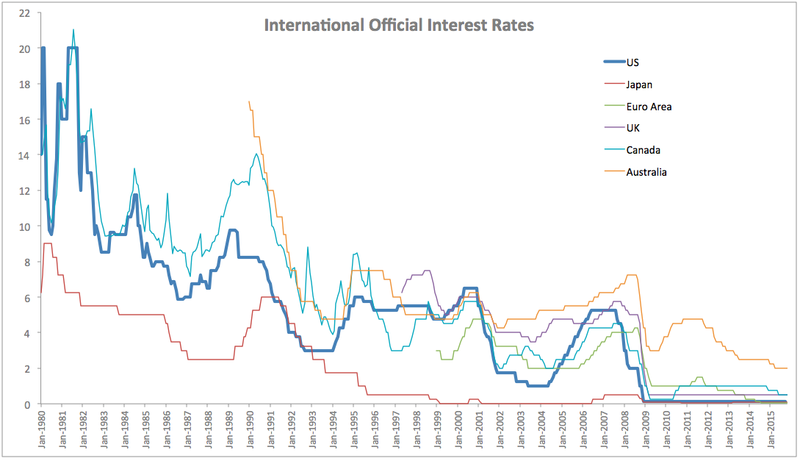 Note: my view has been (consistently over time) that Russia should restructure loans to Ukraine to a longer term, say 10-year, bond extended at original interest rate and allow for 2-3 years interest payments moratorium. Financially optimal solution would have been to impose a haircut on principal and extend maturity of the remaining balance. But, given Ukraine's failure to secure stronger restructuring with private sector lenders, this option is not available and is politically infeasible. 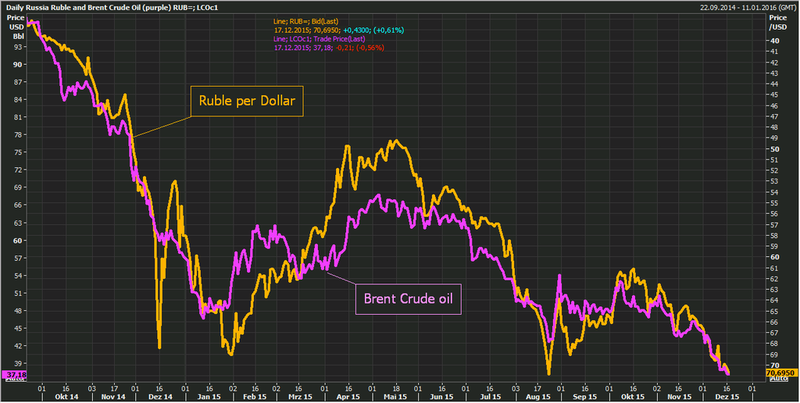 Ruble is now nearing August 2015 lows on a continued trend that realigned with oil prices. 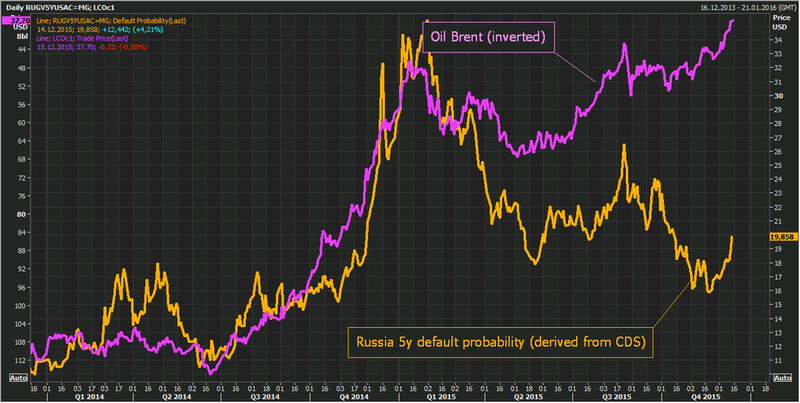 Note: as of yesterday's closing Russian CDS 5 year spread was at 308.91 with implied probability of default of 19.15%. A week ago, same stood at 291.64 with implied probability of default at 18.26% and at the end of Tuesday, at 305.91 with implied probability of default at 18.99%. But as a reminder, watch not only Brent, but also Urals-Brent spread. Hawkish dove of the Fed has less to say on that than Russian energy substitution ongoing in Europe and Turkey via Saudi's and Iranian contracts. 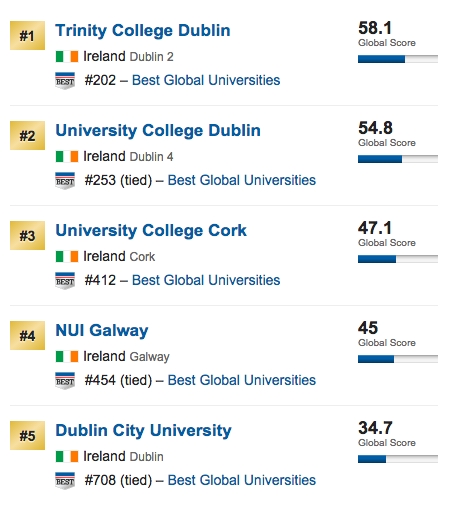 Universities rankings are a hazardous undertaking. Too many moving metrics, too many subjective inputs, too many egos fighting each other and too many euros and dollars and rupees and pounds etc at stake from funding sources. 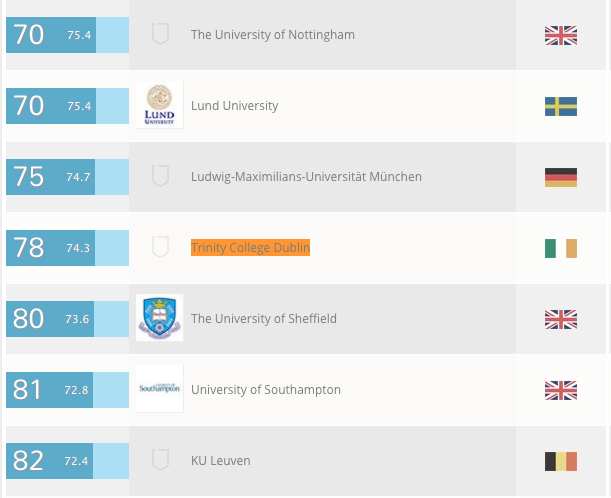 So one really should take them with a grain of salt and in comparatives look at a number of rankings across the board. 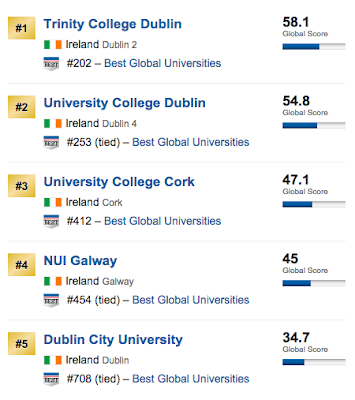 Note: although QS and Wikipedia rankings for Trinity are relatively close, two methodologies are quite different. 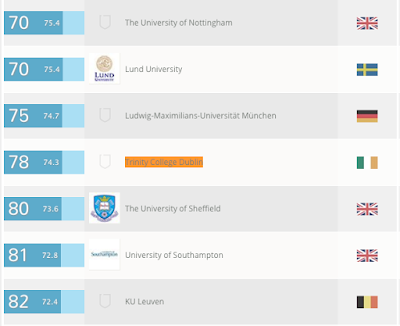 In terms of perceived robustness, ARWU and THE, are seen as top quality rankings, with QS and USNWR methodologies being usually seen as 'intermediate' quality and Wikipedia rankings being, err... a bit off-the-wall. 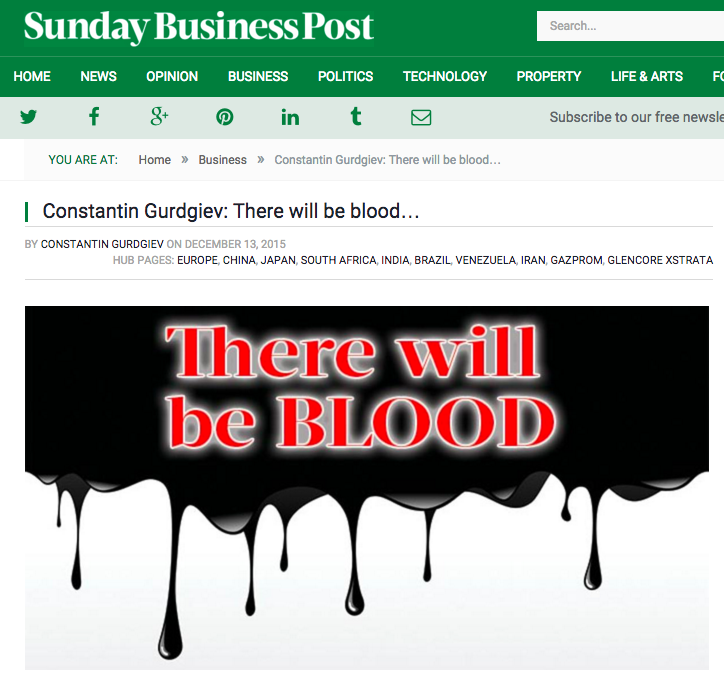 My Article for Sunday Business Post on commodities markets outlook: http://www.businesspost.ie/constantin-gurdgiev-there-will-be-blood/. In recent months, we have observed an ever-increasing cost estimates for Germany (and by a corollary Europe) of absorbing the 2015 inflows of refugees. 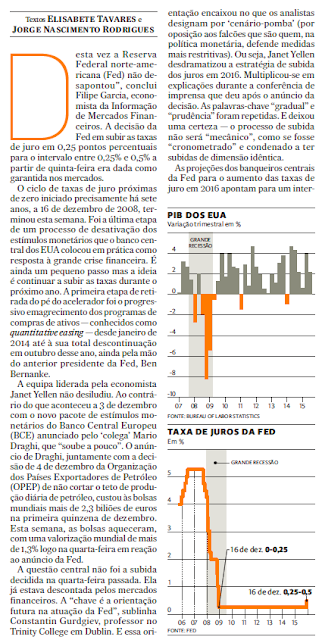 Central to these estimates have been numbers released by the Ifo Institute. These estimates started with the assumed inflows of 800,000 refugees in 2015 and were first pegged at EUR10 billion, “just to cover accommodation and food”. I covered these estimates earlier here: http://trueeconomics.blogspot.ie/2015/09/22915-germanys-ifo-refugees-to-cost-ten.html. Subsequent estimates raised both the number of refugees (to 1,100,000) and the cost per refugee, raising the estimate to EUR21.1 billion (covered here: http://trueeconomics.blogspot.ie/2015/11/111115-new-cost-estimates-of-european.html) and per Ifo including “accommodation, food, creches, schools, German courses, training and administration” over 12 months. In part, very high costs estimates are premised on the assumed ability of refugees to integrate into German labour markets (http://www.cesifo-group.de/ifoHome/presse/Pressemitteilungen/Pressemitteilungen-Archiv/2015/Q4/pm-20151204_Bildung_Fluechtlinge.html) due to lack of language skills, work skills and education. These assumptions - based on population averages and aggregate scores for key countries of origin for refugees - appear to be in line with German employers’ perception of refugees as generally lacking in key basic skills as noted here: http://www.cesifo-group.de/ifoHome/presse/Pressemitteilungen/Pressemitteilungen-Archiv/2015/Q4/press_20151126_sd22_fluechtlinge.html. Taking Ifo Institute’s estimate of EUR19,000 in annual costs per refugee, and based on the EU Commission estimate that some 4 million Syrian refugees currently are in Turkey, Lebanon and Jordan, with some also in Egypt, Iraq and Libya, what are the chances that EU’s latest ‘aid’ to Turkey of a miserly EUR3 billion is going to be enough to address the problem? The answer depends on which model one uses to estimate costs/benefits of inflows. “There have been different calculations about the benefit that refugees bring to the recipient countries. While a Keynesian model using a multiplier analysis until 2035 (!) comes to the conclusion that there are positive net benefits for the incumbent population, generational accounting models come up with frighteningly large loss estimates for the state, reaching between 79,000 and 450,000 euros per person in present value terms. This burden might well prove unsustainable if the number of immigrants continues unabated.” In other words, if you believe in a world where Government spending on anything (be it digging of ditches or building refugees shelter or hospitals) is a positive contributor to growth in the long run, things are just fine. If you believe that there can be misallocation of resources in investment and there can be inefficient transfers across generations as a result of multi annual policy commitments, things are pretty costly. As usual, there is no agreement amongst the economists on the subject of economic impact of refugees. Which is not to warrant any statement about ethical and human dimension of how Europe should be addressing the crisis (economics, of course, is by far not the only consideration on this matter). But it is a good starting point (albeit a bit late for the current crisis) to have a debate as to the merits of different models for selecting refugees based on specific characteristics, such as prior work experiences, basic skills and education. It is also a good point to start thinking about how the balance between humanitarian assistance and development supports (in countries of origin) as well as social supports and workplace integration incentives in the host countries should/could be structured. Ifo Institute position on the subject of host countries labour market and social supports structures is to stress the need for reducing minimum wage (Hartz IV) barriers to labour market entry. Without endorsing this view, here is an interesting link to a study that covered impacts of social welfare nets on entrepreneurship amongst migrants in the US, Canada and the UK (with Canadian experience being very interesting as Canadian model of highly selective migration filters is being advocated for Europe): http://trueeconomics.blogspot.ie/2010/02/economics-07022010-human-capital.html. The refugees crisis of 2015 (and possibly 2016 and on) is testing European systems (labour markets, social welfare, capital structures etc) along the economic dimension. The debates and policy responses so badly needed today should have taken place years ago. Absent these, we are now staring at the possibility that this crisis will alter our political systems, while stressing our economic and social systems. A right response would, in my opinion, involve recognising first and foremost the humanitarian dimension of the crisis, while accelerating the process for developing long term economic responses. Note: this post is a follow up on my appearance on Bloomberg Radio last morning discussing the topic of economic impact of the refugees crisis. My first column for Russian current affairs magazine Slon is out covering outlook for Russian economy for 2016: https://slon.ru/posts/61120. I spoke about the topic on Russian TV Channel Dozhd' (Rain): https://tvrain.ru/teleshow/slon_na_dozhde/dollar_71-400099/. 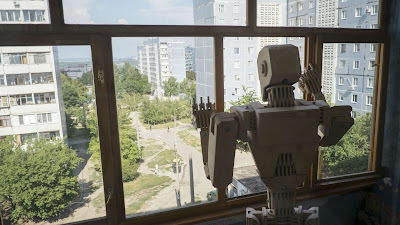 Recently, I gave an interview (in Russian) to Strelka Institute in Moscow. The interview covered the importance of linking economic development and urban design to sustain a C.A.R.E system of supports for human capital-intensive economy. Here is the interview link: http://www.strelka.com/ru/magazine/2015/12/01/gurgiev. Evolution of per-capita metrics and the dynamics of the crisis. 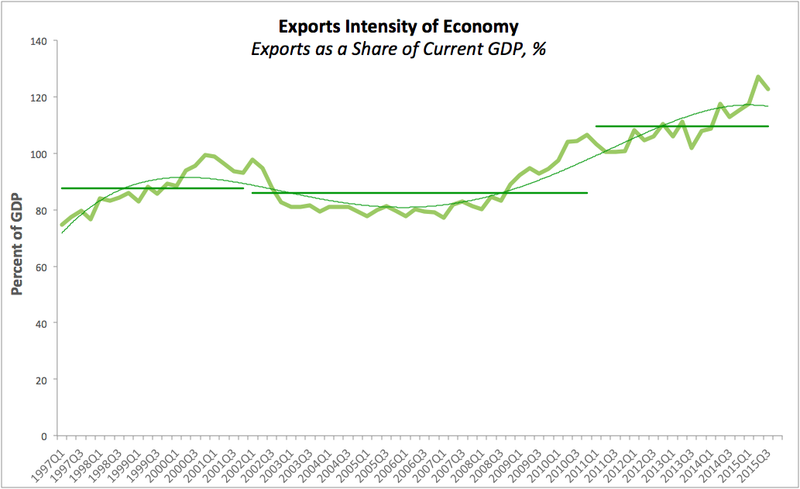 So let’s get down to the last post on the matter of Irish National Accounts for 3Q 2015: the subject of Irish economy’s dependency on MNCs… err… exports that is. Real Exports as a share of Irish real GDP stood at 120.1% in 3Q 2015, the second highest proportion on record, down from 123.0% in 2Q 2015 which was record-breaking level. Similarly, Nominal Exports as a share of nominal GDP fell from 127.2% in 2Q 2015 (highest on record) to 122.7% (second highest). This is a remarkable set of numbers, driven predominantly by the activities of MNCs in Irish economy, and a number that is a signifier of all that is wrong with our National Accounts. Unlike countries that serve as a basis for production, Ireland serves as a basis for both some production of goods and services, but also as a platform for large scale tax optimisation. Vast majority of our exports are accounted for by MNCs trading from here, with large share of activity not taking place here, but being booked into Ireland from abroad. This distorts actual levels and value of production, but it also distorts the metrics of this economy’s openness to trade. They can be booked into here and then expatriated, but remain on our books, as long as the MNCs is domiciled here (e.g. company created as an Irish entity via inversion). 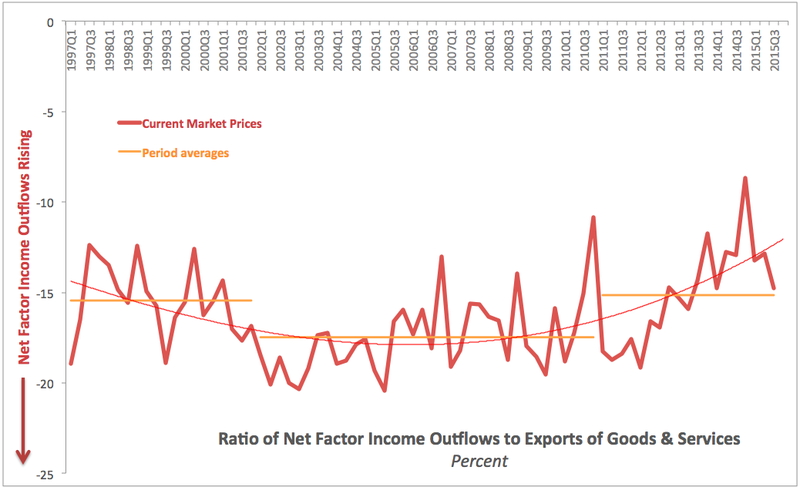 Do note that over 2011 - present period, average net outflow of factor payments abroad has fallen as a share of Exports from 17.5% in the period of 1Q 2002 - 4Q 2010 to 15.1%, the lowest period average on record. In other words, during the last 4 and 3/4 years MNCs operating from Ireland have been expatriating fewer profits abroad than in other periods in history. Question is: what happens to these retained profits over time? Obviously, these MNCs have absolutely no interest in re-investing these profits in Ireland (there is neither the scale for such reinvestment, nor the need). This suggests that either these profits are being parked until such a time as when they can be expatriated for the purpose of funding MNCs investments around the world, or the MNCs overall switched to declaring lower profits as a share of their exports. 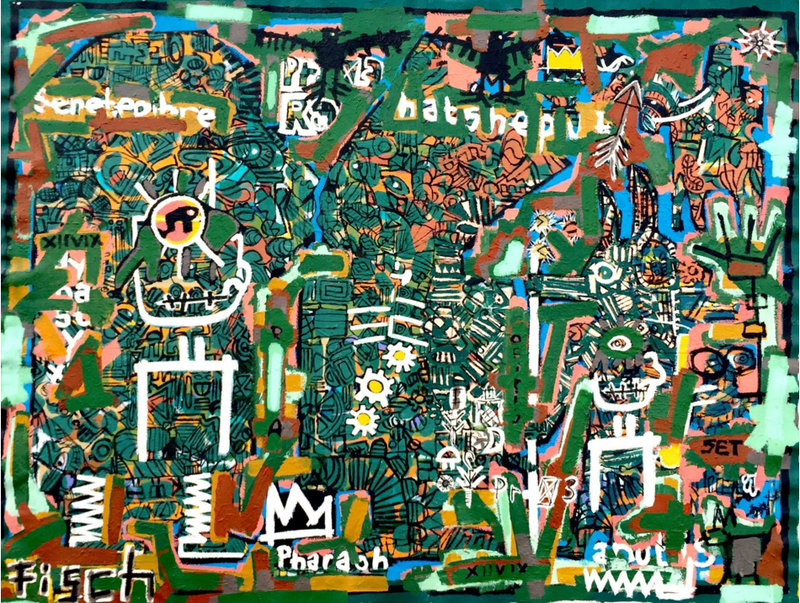 Truth is - we do not know what is going on, though we do know that something is afoot. 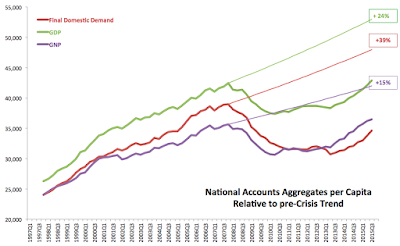 Now, as usual, let’s take a look at the evolution of 3 per-capita metrics and trace out the dynamics of the crisis. In 3Q 2015, Personal Expenditure per capita for the last four quarters totalled EUR 19,343, which represents an increase of 2.78% on four quarters total through 3Q 2014. Relative to peak 4 quarters total (attained in 4Q 2007), current levels of Personal Expenditure on Goods & Services on a per capita is 7.14% below the peak levels. In other words, 7 and 3/4 of the years down, Personal Expenditure on a per capita basis is yet to recover (in real terms) pre-crisis peak. Per capita Final Domestic Demand (combining Personal Expenditure, Government Expenditure and Fixed Capital Formation) based on the total for four quarters through 3Q 2015 stood at EUR 34,616, which represents an increase of 7.75% y/y. 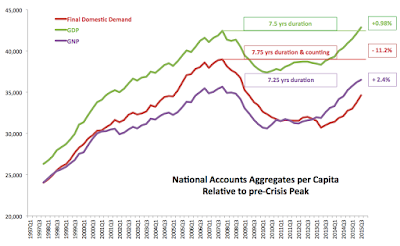 This level of per capita Demand is 11.19% lower than pre-crisis peak attained in 4Q 2007. As with Personal Expenditure per capita, Final Demand per capita is yet to complete crisis period recovery, 7 and 3/4 of the years down. On the other hand, GDP per capita stood at EUR 42,870 on a cumulative 4 quarters basis, which is 6.2% above the same period for 2014 and is 0.98% above the pre-crisis peak (4Q 2007). Hence, GDP per capita has now fully recovered from the pre-crisis peak and it ‘only’ took it 7.5 years to do so. GNP per capita has recovered from the crisis back in 2Q 2015, so at of Q3 2015, 4-quarters aggregate GNP per capita stood at EUR 36,508 which is 5.85% ahead of the same period through Q3 2014 and is 2.39% above pre-crisis peak. 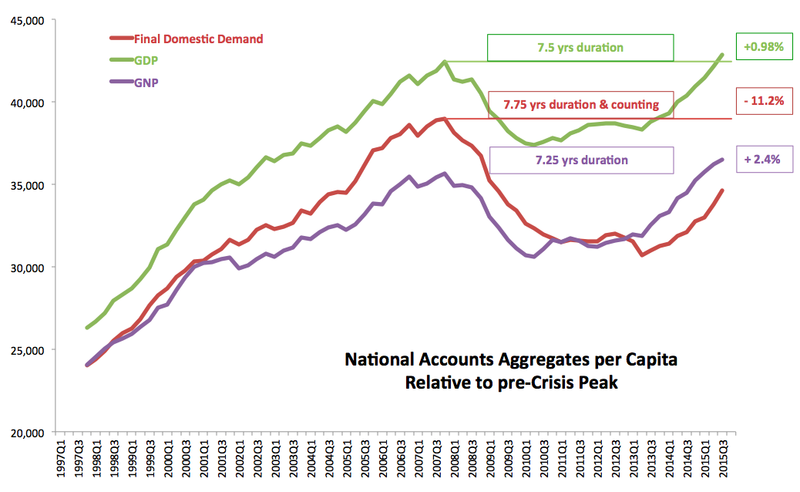 In other words, it took 7 and 1/4 years for GNP per capita to regain its pre-crisis peak. It is also worth looking at the potential levels of output per capita ex-crisis. 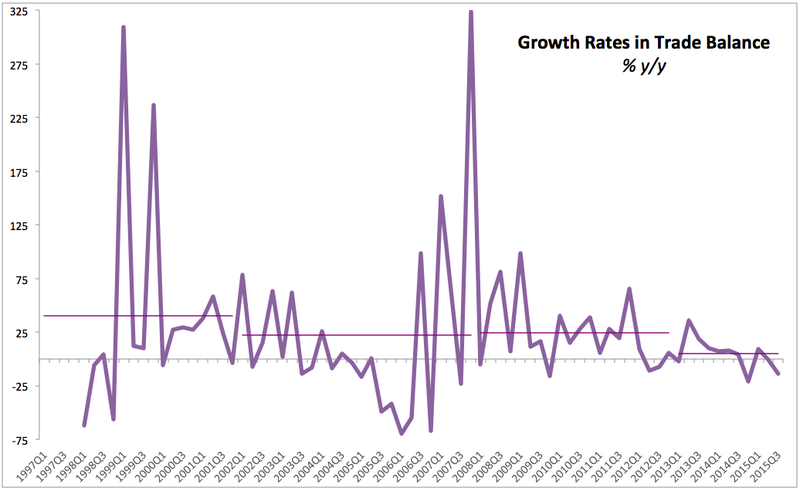 To do so, let’s take average growth rates for 4 quarters moving aggregate GDP. GNP and Domestic Demand, for the period 1Q 2002 through 4Q 2007. 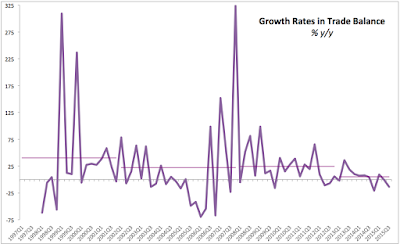 Note 1: this period represents slower rates of growth than years prior to 1Q 2002. Note 2: I further removed all growth rates observations within the period that were above 5 percentage points for GDP and GNP and above 4% for Final Demand, thus significantly reducing impact of a number of very high growth observations on resulting trend. I’ll let everyone draw their own conclusions as to the recovery attained. In the first post of the series, I covered Irish National Accounts 3Q: Sectoral Growth results. The second post covered year-on-year growth rates in GDP and GNP, while the third post covered quarterly growth rates in GDP and GNP. 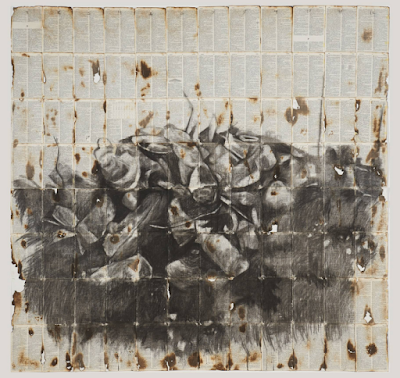 The fourth post covered Domestic Demand. Now, consider external trade side of the National Accounts. Irish Exports of Goods & Services stood at EUR62.52 billion in 3Q 2015, a rise of 12.4% y/y, after posting growth of 13.5% y/y in 2Q 2015 and 15.5% growth in 3Q 2014. 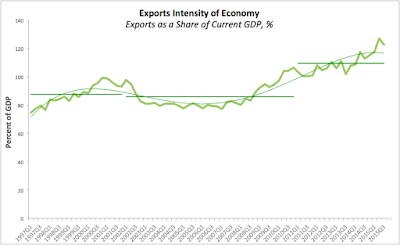 Over the last four quarters, Irish Exports of Goods & Services grew, on average, at a rate of 13.4%, implying doubling of exports by value roughly every 5.5 years. If you believe this value to be reflective of a volume of real economic activity taking place in a country with roughly 1.983 million people in employment, you have to be on Amsterdam brownies. Over the 12 months through 3Q 2015, Irish economy has managed to export EUR235.67 billion worth of stuff, or a whooping EUR27.828 billion more than over the same period a year before. That’s EUR118,845 per person working at home or at work in Ireland. Now, moving beyond the total, Exports of Goods stood at EUR34.062 billion in 3Q 2015, up 16.07% y/y - a doubling rate of 4.5 years. Exports of goods were up 16.03% y/y in 2Q 2015 and 16.9% in 3Q 2014, so over the last 12 months, average rate of growth in Exports of Goods was 18.01%. In other words, Irish Exports of Goods (physical stuff apparently manufactured here) are running at a rate of increase consistent with doubling of exports every 4 years. Exports of Services are still ‘lagging’ behind, standing at EUR28.458 billion in 3Q 2015, up 8.2% y/y in 3Q 2015, having previously risen 10.5% in 2Q 2015. Both rates of growth are below 13.9% heroic rate of expansion achieved in 3Q 2014. Over the last four quarters, average rate of growth in Irish Exports of Services was 8.6%, to EUR107.29 billion. However, in order to produce all these marvels of exports (and indeed to sustain living and consumption), Ireland does import truck loads of stuff and services. Thus, Imports of Goods and Services overall rose to EUR52.788 billion in 3Q 2015, up 18.9% y/y and beating 16.5% growth in 2Q 2015 and even 18.75% growth in 3Q 2014. Over the last four quarters average rate of growth in Imports of Goods and Services was impressive 17.6%. Some of this growth was down to increased consumer demand. Imports of Goods alone rose 5.1% y/y in Q3 2015, compared to 8.1% in 2Q 2015 and 16.7% in 3Q 2014 (over the last four quarters, average growth rate was 10.1%). Imports of Services, however, jumped big time: up 27.9% y/y in 3Q 2015, having previously grown 21.8% in 2Q 2015 and 20.2% in 3Q 2014 (average for the last four quarters is 22.6%). Of course, imports of services include imports of IP by the web-based and ICT and IFSC firms, while imports of goods include pharma inputs, transport inputs (e.g. aircraft leased by another strand of MNCs and domestic tax optimisers) and so on. 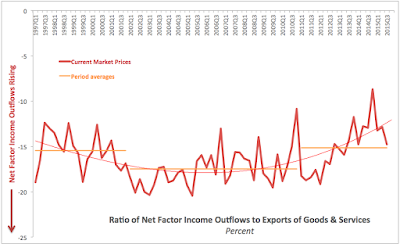 Both, exports and imports changes are also partially driven by changes in the exchange rates, which are virtually impossible to track, since contracts for shipments within MNCs are neither transparent, more disclosed to us, mere mortals, and can have virtually no connection to real world exchange rates. All of which means that just as in the case of our GDP and GNP and even Domestic Demand, Irish figures for external trade are pretty much meaningless: we really have no idea how much of all this activity sustains in wages & salaries, business income and employment and even taxes that is anchored to this country. But, given everyone’s obsession with official accounts, we shall plough on and look at trade balance next. Ireland’s Trade Balance in Goods hit the absolute historical record high in 3Q 2015 at EUR15.602 billion, up 32.4% y/y and exceeding growth rate in 2Q 2015 (+27.5%) and 3Q 2014 (+17.2%). 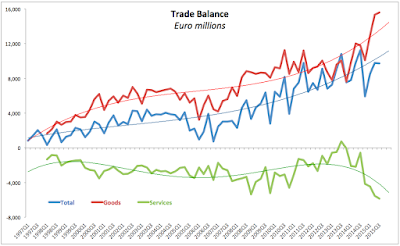 Meanwhile, Trade Balance in Services posted the largest deficit in history at EUR5.87 billion, up almost ten-fold on same period in 2014, having previously grown by 154% in 2Q 2015. Thus, overall Trade Balance for Goods and Services fell 13.4% y/y in 3Q 2015 to EUR9.732 billion, having posted second consecutive quarter of y/y growth (it shrunk 0.51% y/y in 2Q 2015). 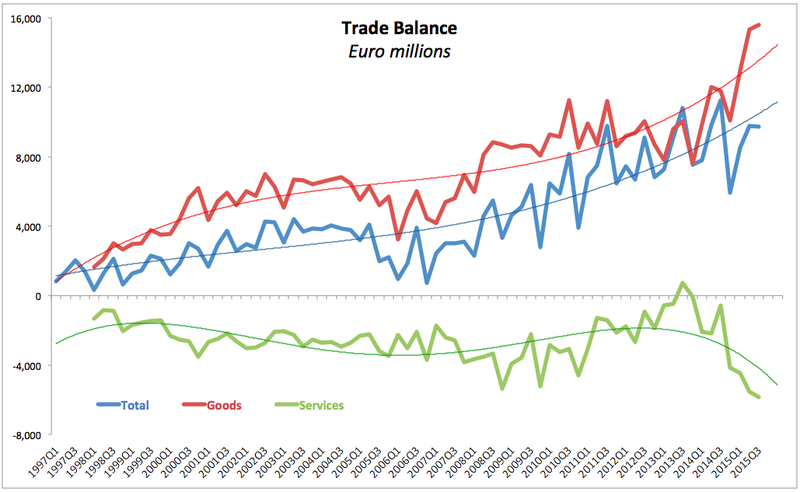 As chart above shows, overall Trade Balance dynamics have been poor for Ireland despite the record-busting exports and all the headlines about huge contribution of external trade to the economy. On average basis, period average for 1Q 2013-present shows growth rate averaging not-too-shabby 5.1% y/y. However, this corresponds to the lowest average growth rate for any other period on record, including the disaster years of 1Q 2008 - 4Q 2012 (average growth rate of 24.3% y/y).